If you’d like to join in the fun, do a short vlog on your blog, link up below in the linky, post the above button on your site and link to me. Each week we will have questions, subjects or ideas that we can all talk about on our vlog. Visit the other participants, learn about them and have fun! It’s not too late – you can link up anytime during the week. 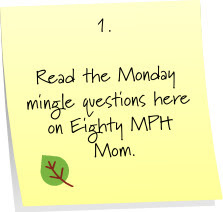 **It is important to link to Eighty MPH Mom, so people can easily find the other minglers. Please keep those questions coming! 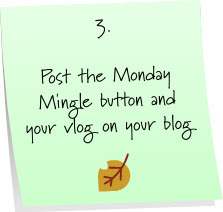 Monday Mingle will publish at 3:00 p.m. each Sunday – so you can link up before Monday, if you choose! Have you missed a Monday Mingle or two? You can catch up on previous mingles by clicking the link above. 1. Currently, what are your top 3 favorite television shows? 2. What is one restaurant you wish you had in your area? 3. 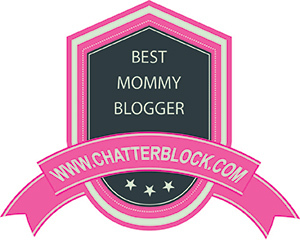 What do you feel is the toughest part of being a parent (even if you aren’t one!)? PLEASE POST MY NEW MONDAY MINGLE BUTTON (IT LOOKS THE SAME, BUT THE CODING IS NEW), in place of the old button – THANK YOU! Monday Mingle – May 10th from Jennifer Regan on Vimeo. 3. Name one thing from your bucket list – something you hope to achieve before you die. THIS IS NOT A GIVEAWAY LINKY, OR A LINKY TO ADVERTISE YOUR BUSINESS! 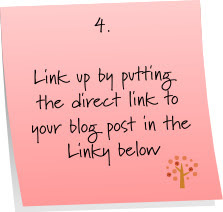 PLEASE ONLY USE THIS LINKY IF YOU HAVE POSTED A MONDAY MINGLE ON YOUR BLOG! Thank you. Just a side note. I know you are not looking for opinions but I REALLY don't like the link program you used today. I rather see the actual blog names then the URL to the mingle like this one is showing. Love the mingle though. I think I may be hooked. Hmm. I thought i added my linky. But it isn't seem to be showing. If I enter it twice, which i might do again, you can delete just one. i vote for the old linky. This one is lame. Yum. Nice plug for lizzie btv. i plugged her as well. 5 seconds and it says it should be there. I still don't see mine. Can you help a girl out? Yeah, my mingle just isn't showing up on this linky. i tweeted my mingle instead. I like the hills, except spencer and heidi are such DB's…so I can't stand them. I've been to Olive Garden once. And it was embarrassing. The waiter called me an Olive Garden Virgin. Oh em gee. LOL Brand LOVES In and Out Burger! I think he likes the shirts more than anything though. Ha! I'm going to get some questions to you soon!! LOL I never got sucked in to The Hills but I'm one of those people who if I watched it would more than likely get sucked right in! I'm not a fan of the crazy plastic surgery girl though! Olive Garden is one of my FAVORITES! I love Italian food. I've been craving pasta for weeks now, I think I need to pay the OG a visit! Watching anyone hurt for me is a biggie, I cried last week when B put a bug in the toilet without killing it first so the poor little guy was swimming circles for an hour until *gross alert* I rescued him with a piece of plastic LOL I'm far too empathic. Don't you wonder how we ever watched TV without DVRs? I have never seen The Hills, except clips on The Soup, but I have seen Spencer and Heidi on I'm a Celebrity Get Me Out of Here – YIKES! I love Olive Garden. They just built one here a few years ago. This is my first time mingling! What a great idea! I so agree about your children hurting, I am the same way. I also agree with your comments about LizzieB. She is really good on video, and seems like such a wonderful person. I've been tuning into her site for a bit now. Again, thanks for being so welcoming! I really love The Olive Garden, too. We actually have 3 in the immediate area, we are really lucky. I really like the TV show "The Closer" also, but my hubby hates it, so I DVR it and watch it during the day while he is working on his computer upstairs. Just like I told Erin, It really makes me sad when my kids are hurt or sad and there is nothing I can do to make them feel better. I think that is a universal thing for all moms. Olive Garden, we have one close to us, but there's an ICKY story going on around here about Olive Garden so I won't be eating there anymore. Hmm yes, I don't think I'll like Charlie's heartache when she's older.